Raahgiri Day, a day in which streets are closed to cars and open to pedestrians and cyclists is a time to celebrate community and human-centered mobility that is swiftly expanding throughout India. Photo by EMBARQ. Raahgiri Day, the weekly event that closes city streets to cars to celebrate walking, biking, music-making, and socializing, has expanded beyond Gurgaon, India. The New Delhi Municipal Council (NDMC) together with the New Delhi Police Department has decided to stage the first Raahgiri Day in New Delhi this weekend. Beginning July 13, 2014, the inner circle of New Delhi’s Connaught Place and its various radial roads will be converted into pedestrian and cycling zones each Sunday. This is a pivotal moment for sustainable, active transport in India’s cities. Moving from the city of Gurgaon, population 800,000 people, to New Delhi, population 22 million, is a huge leap, one that reminds us that reorienting cities around people – not cars – is achievable. This starts New Delhi on an important path towards combating air pollution and improving public health, and moves all of India one step closer towards being an exemplar of sustainable urban development for other emerging economies. New Delhi already houses 22 million people within its metropolitan region, and this number is growing annually at a rate of 4.6%. This rapid population increase, combined with shifting consumption patterns and increasing infrastructure development, have created more congested roads and compromised public spaces. Delhi is fighting air pollution that is worse than Beijing’s while simultaneously finding that less than 5% of women feel safe in the city’s public spaces. Leaders have been actively searching for innovative ways to show its residents that it is possible, with public support, to make the megacity more livable. With Raahgiri Day, it seems to have found an answer. Raahgiri Gurgaon, which began in November 2013, has proved that even in an increasingly motorized city, sustainable mobility is possible. Its success has sparked a shift in mindset and lifestyle among city residents, many of whom have now become proponents of active transport. 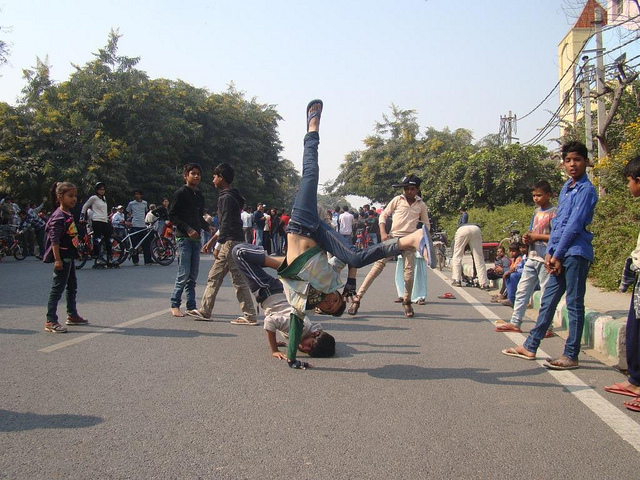 A recent survey conducted by EMBARQ India in Gurgaon found that Raahgiri Day has had a positive impact on everything from non-motorized transport usage to road safety, greater engagement between local businesses and the community, and increased levels of physical activity. Furthermore, average particulate matter readings on Raahgiri Sundays in Gurgaon were 95 parts per million (ppm) less than the typical weekday in the city (99 ppm compared to 194 ppm). With Delhi’s mortality rate doubling in the past two decades due to air pollution, the potential for Raahgiri Delhi to improve public health and clean the air cannot be ignored. Expanding Raahgiri to Delhi required collaboration between government and civil society. For example, the Delhi Police and NDMC conducted route reviews to evaluate potential sites in the heart of the city, while the initiative in Gurgaon was originally spearheaded by a founding group of NGOs, namely EMBARQ India, Pedal Yatri, India Cycle Service, I am Gurgaon, and Road Safety Officers. Moreover, EMBARQ India and NDMC plan on expanding Raahgiri Delhi even further, expanding routes within the city and gradually increasing attendance. In order to help Raahgiri Day gain traction in Delhi and other Indian cities, EMBARQ India’s Amit Bhatt hosted a webinar on The Hub to share lessons learned in implementing this event in Gurgaon to inspire and instruct other cities. Experts in the fields of sustainable transport and urban development joined representatives from India and around the world – including Delhi, Gurgaon, Ahmedabad, Mumbai, Bangalore, Hyderabad, Chennai and Pune in India as well as cities in the Netherlands, Australia, Germany and Canada – to explore what active transport and streets for people could do for their cities. The cities of Ludhiana and Navi Mumbai have already followed Gurgaon and Delhi’s lead to begin Raahgiri Days of their own. It is no longer a question of whether Raahgiri day has been a successful sustainability initiative, but simply a question of which city will join in next.